How do I fix errors on my hard disk? - Ask Leo! Hard disk errors come from several different sources, and as a result there are several different approaches to resolving them. I don’t have anything specific to that error, but what I’ll do instead is outline the various steps I take when attempting to diagnose and repair a problem of this nature. Soft: what I’ll call “soft” errors are errors in the data written to the disk. There’s absolutely nothing wrong with the disk itself, it’s simply that the data written to it has somehow become corrupt. Hard: what I’ll call “hard” errors are errors in the drive itself. Actual physical or electrical failure of some sort that would require the drive to be replaced or repaired. Firm: “firm” errors are those errors that are actual physical issues on the magnetic media of the hard disk, that can be repaired by software. This is going to cause the most confusion, since these types of errors can manifest in exactly the same manner as either soft or hard errors. Here’s the problem: if you experience a failure, such as “$mft corrupt”, or an operating system that won’t boot, or a file that reports a CRC error, how do you tell what kind of failure you have? Ultimately, you don’t. Just about any symptom of a hard disk failure could be a soft error, a hard error or something in between. … if you experience a failure, … how do you tell what kind of failure you have? Chkdsk’s primary function is to check for problems in the file system, in other words it checks for soft errors in the data that’s been written to the disk. If there’s a problem in the file system, chkdsk will attempt to correct it. If the problem I’m experiencing has not been resolved by this, I then move on to the next step which is to run “chkdsk /r”. The “/r” switch instructs chkdsk to “Locate bad sectors and recovers readable information”, which starts to send chkdsk into the realm of what I’ve been calling “firm” and “hard” errors. “Bad Sectors” can happen for several reasons, and chkdsk will attempt to identify them, mark them as bad so they won’t get used again, and move any data that is readable to different sectors. I run “chkdsk /r” separately because it can take significantly longer than regular chkdsk. If after “chkdsk /r” the disk still has problems, it’s time for a big gun: SpinRite. SpinRite is not free. (At this writing,it’s $89.00 US.) But in the face of a hard disk failure and the potential for lost data it can often be worth every penny and then some. SpinRite’s focus is on what I’ve called “firm” errors – those areas on the magnetic media of the disk that can be recovered by software. SpinRite is that software. SpinRite actually pays no attention to the file system on the disk. It could be FAT32, NTFS, or even a Mac or Linux formatted disk, SpinRite doesn’t care. It looks only at each individual sector, one at a time, and attempts to ensure that the sector is readable. As a result SpinRite will not fix file system errors; it’s not looking for those, and that’s why we started with chkdsk above. However, SpinRite can often fix what other tools cannot: unreadable sectors. SpinRite uses some fairly intense data recovery analysis to try to get the data from sectors that are unreadable through normal means. And in fact, that’s one of the primary differences between “chkdsk /r” and SpinRite. When chkdsk encounters a bad sector it says “oh, I can’t read this, so we better mark it so we don’t try to use that sector again” – which loses the data in that bad sector. SpinRite instead will say “oh, this read failed – let’s use some other techniques to try to recover the data, and if that succeeds then we’ll decide whether the sector can be re-used safely”. You stand a significantly greater chance of recovering the data from a bad sector with a tool like SpinRite. What’s the only downside of SpinRite? It can take a while. The time is proportional to the size of your disk and the number of problems it encounters along the way. But as I said, as with the money the time can also be an incredibly worthwhile investment if it means not losing your data. The key to understanding SpinRite is simply this: it will not fix filesystem errors, that’s chkdsk’s job, and it cannot repair actual broken hardware. But what it can often do is recover data from a hard disk’s damaged magnetic media. If SpinRite reports that sectors cannot be recovered or worse, then it’s time to consider replacement. Even if the disk is functional, for example with the intermittent error you’re seeing, I’d consider it too risky to continue to rely on. Copy off and backup what data you can, and replace the drive. As I said above, the root cause of hard disk errors can be difficult to identify. A bad sector on the drive, if in the wrong place, could render a machine unbootable, could cause a program to randomly crash, could manifest as an actual “CRC” error … or could not show up at all. And all of those same symptoms could be due to corruption of data on the disk (soft errors), actual hardware failures (hard errors), or damaged, but potentially recoverable data on the disks magnetic media (“firm” errors). Chkdsk plus SpinRite won’t resolve every situation, but knowing to use them may save you from data loss in many situations. How Do I Fix a Cyclic Redundancy Check Error When I Try to Copy a File? - CRC errors happen when there's a bad spot on the media of your hard disk. Data recovery and disk repair are often possible with the right tools -- but you won't need them if you have a backup. Leo, does SpinRite make data recovery more difficult for the professional services if SpinRite itself is unable to recover the data? I’ve heard that you should stop using a dying drive immediately to prevent further data loss. SpinRite would increase disk activity, right? (and yes, backups would have made this a moot point, but at the time I didn’t know any better). That’s a good point. SpinRite’s maintenance mode works by re-writing the data on the disk. I’ve referred to it as a “reformat without data loss” since it refreshes the data in every sector. The act of rewriting that data would, indeed, make forensic recovery more difficult. As the problem is a possible failing hdd the first step should be to clone the hdd. twice in the last 6 years i’ve seen corruption messages that do not let you boot into windows. both times i have brought up the pc on knoppix, backup the info for safety, then replaced the corrupt file (usually a .dll)from a working pc with same os and the computer runs fine for years. I have a HD that was dropped and is no longer seen by the computer. Is it possible to transfer the disk platters to an identical enclosure? Assuming dust is a problem, maybe a small dust free enclosure can be made? I really need access to this HD as it contains (old) confidential medical information and sending it out to a clean room is out of the question. No. That’s not something you can do without specific, custom (and expensive) equipment, a cleanroom being only one part. 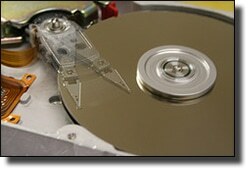 If it’s that important then “out of the question” or not, a data recovery service is really your only hope. I had a WD External drive go bad on me a few months ago and I took it into a computer fixing place I know (“User2” in Edinburgh) and they plugged it into a machine running on Linux and were able to read it OK and to copy all except a few files over from the bad drive onto a new one. I was very happy to pay the money for the new drive and the copying work. Indeed. Which is why chkdsk was first on my list. However note also that it keeps wanting to check (chkdsk) at boot time as well, so it’s likely not that simple. my Dell D600 says it doesn’t recognize chkdsk in any way???? what gives? We’d need the exact error message. Re: my previous post…(and sorry about the typo’s). I also tried to access the SpinRite url, but it to will not load. This window remained open, but seemingly just froze there. Any ideas as to the problem? I notice you don’t mention another possibility here which is a faulty hard-disk controller, located on the mother-board. I had some boot problems recently and when I booted into safemode and looked in the event viewer I saw a whole bunch of disk errors. I connected the disk to another computer to save the data and noticed that there were no errors in the event viewer on the second computer. The problem was the IDE controller on the motherboard. Please I need your answer to my problem. Usually I scan my drive in read-only mode every week just ti make sure my drive is in goo shape all the time and when I find errors I run chkdsk with /f /r. However, I gave my notebook to a friend who return it to me after month and found there were lot off errors when running chkdsk, I’ve done it with /f /r several times and after each I run it in read-only to see if there are any errors and there were some errors showing. So I reformatted my notebook with normal format for the HD not “Quick” and did clean XP install. once the IS was running I did the chkdsk in read-only and there was no errors but after installing my applications and using the notebook for few hours I scanned the HD in read-only and again there were bunch of errors found in the HD and got that message which tells you chkdsk cannot continue and to use /f. Again, I did it with /r /f three times but when I scanned it in read-only after that I found errors!! I dont need to recover any data but I don’t feel right about my HD while it’s giving errors like this that cannot be fixed. What do you suggest, is there any software I can use to resolve this, can SpinRite fix it keeping in mind that I can get a brand new HD with the same price! or it’s better to change the drive? You’ll have to make the call on price, but this sounds like a case that SpinRite would clear up. im having problems with my hard disc drive i had a guy take it to clean it up disc defrag making files easier to find and making it run faster while he was doing that some errors on the disc came up inbetween the system data and the data stored on the hard drive and now i can not access the data on the hard disc so is there anyway that i can get to those files? sir i fujistu semiens hard disk 250 gb hard disk.that hdd is running now.wherever i want to format that hdd they can’t go further 1%.i m not ablt understand what d problem is and how can i solve it. hi Leo, i have an intel macbook and i have a 500 gb iomega external hard drive to make my security copies on time machine but suddenly, one day my macbook stopped showing me my disk on the desktop. I can not see my hard disk drive on any computer, no matter if the operating system is windows or mac and i plug another external hard disk to my mac and it works perfectly. It all begins when the time machine utility send me an error. how do i repair my master boot record on portable hard drive? I have a Windows Vista Basic SP1 computer that continualy has errors. I originally thought it was the software loaded on it and did a complete reimage of the hard drive. But, I still had problems on the C: drive…it’s become apparent to me that it’s the hard drive and have decided to replace it. Since the recovery files (D:) are also on the bad drive, how do I copy them from the D: drive so that I can image the new drive with the same information (so the new looks exactly like the old). Thankyou so much for giving solution for it. I used “chkdsk D: /f” commnad which is posted by urself, which got my D: recovered. Once again i appreciate your work thanks alot. It was really helpful. My Hard drive was not read by BIOS on booting so I formatted my drive and copied files 100% and didnt continue beyond that.My OS is XP pack 2.I have troubleshooting and now hard disk(IDE) can be detected but booting canot complete.Please someone assist.The error I guess is because of the formating that was never completed. I am using OSX version of Mac Os and there is some start up issues with my system. My system was unable to boot up. The reason being that my Master Boot Record was damaged. So, I erased and installed the Mac file system and then my computer booted. Doing so deleted some of my important files on Mac hard drive. I used a software called Data Recovery Mac to recover the deleted items. It recovered the deleted items but some of the emails are still not recovered. Is there any way to recover them? In my case OS X operating system freezes while it is on go and due to which I have faced lots of problems. Then one of my friend has suggested me about inbuilt utilities to repair the issue but all failed. As the last option I have formatted the hard disk and every things is resolved. But before doing that I have used OS X Data Recovery software to recover the important data’s. Thanks to this software which has saved my important data from being damaged. My laptop harddrive(WD) cannot read be read and it is giving me a error msg (002:Fixed disk error). I formatted the harddrive and it is giving this msg how can solve this. I backdate my system to initial and while process there is power failure and short down. But when there was light i on the system booted and cannot open the window and short down itself.what will i do? Can i use SpinRite to fix an external hard drive? How do I disable the beep sounds from Spinrite? You’re not really administrator: Why does my computer say I need to be administrator, when I am? My hard drive (with all my data) has died. I am wondering if I can repair the disk with SpinRite (or other) as opposed to just getting the data off. I use XP Pro. My proble – whilst using Excel it started crashing every time I tried to perform a task – giving me the “Unrecoverable error….. send to Microsoft” message. I opened Excel twice and the same thing occurred. I rebooted the machine… and nothing happened. I tried booting off an XP recovery disk – but it only gave me the option to reformat and clean install. I have how done a clean install of XP on a different hard drive, and connected my original as a second drive. In Explorer – if I try to view the disc it says “this disc is not formated, do you want to format…”. If I right click properties on the drive it tells me its 160GB drive, format is “RAW” and that the disc is full. In Control PanelAdmin ToolsComp. ManagementDisk Management it tells me 152GB Healty (Active) but if I try and do anything “drive G: not fomatted….”. I’ve opened a dos window (cmd) and tried chkdsk r and get Data error (CRC). Is there anything else I can do, and do you think Spinrite would help? It’s what I’d try next. They’ll refund your money if it doesn’t. It sounds like a file or some files have been damaged on your hard drive. In your shoes I’d run a live Linux or Windows PE disk to try to backup any documents from my hard drive. (I can’t give any more details on what to back up as you haven’t specified which OS you are using). Then I’d try a repair re-install from my Windows installation disk. If that didn’t work I’d try a fresh install. I have a Acer laptop and it just stopped starting window OS which was there. I thought to format the OS, it may be the OS have been corrupted. When I tried to start formatting in Win 7, it just halts during fresh installation process. I tried in Ubuntu and I got some error message like “some bad sectors are there”. How can I solve the issue in my hard drive? Leo, I have this issue but with an external drive that is not a boot partition. The drive was dropped, and it is not recognized by the computer it is normally plugged to (win 7 x64 home) but when I plug it into my desktop (win xp x86 pro) it shows up, disk check fails from windows and the command line, if I try to access the drive with open or explore in the right click context menu the computer freezes, but if I power it off I get a flash of the window showing my files, I have never used xcopy but decided to try, my machine seems to freeze during xcopy but I get no error dialogue saying xcopy failed, should I continue to wait on xcopy or do I just need to break down and send it to a recovery service. Also I get the windows delayed write failed p:\$mft could not be saved please try to save this file somewhere else. I’m thinking that the drive is quite hurt. If the data is important and not backed up elsewhere (hint for the future) a recovery service sounds like a plan. I always keep an Acronis copy of both my C drive and data drive. I make this copy every month. This month while copying the C drive Acronis stopped at the 3% mark and said that the sector on the C drive was unreadable, Retry, Ignore or Ignore All. Retry didn’t work. When I hit Ignore All, the copy stayed at 3% permanently. When I hit Ignore, I had to do it over and over and over as different sections kept showing up. Finally after 30 minutes of frustration, I hit Ignore All and it stalled again at 3%. I attempted a CHKDSK of the C drive with the F option (I have Win XP Pro SP3) and was told that it would begin at the next bootup. Well it did, but the results flew by so fast all I caught were the words “Bad Sectors”. Evidently the F option wasn’t in play because the problem persisted. Today I tried booting up using the disk that I was attempting to copy to, but that disk is now unbootable. So I’m working with the same C drive but I’m flying without a parachute. I do not have a bootable CD and don’t have my Acronis serial number to register and get one from them (if needed). How can I get a successful copy of this drive? Can I put my C drive in another computer and run a CHKDSK /r or /f on it? Are they two actual physical drives? If so you certainly might want to try it in another computer. That’s why an external drive and boot media is so important. Yes, I do my backups by cloning my C drive and my data drive once a month. I don’t have a bootable CD – I don’t know how that would help. I’ve been using this system for years but now it seems my C drive is getting old. I’ll do as Leo suggests, since the other PC has the same mb and OS as mine. If I can get it fixed so that it will clone, I’ll replace it with a new HD. I have to be very cautious here, because this is the only drive that has my OS. Well, if you connected it to another computer then it’s at least not the OS drive on that other computer. SOME program has a file open on it – it could be as simple as Windows Explorer, so be sure to close all programs. But then I typically say “yes”. I think I just figured it out. I ran the PC in safe mode with command prompt option. I didn’t get to see the result, but I’ll test the cloning procedure later. …and it failed again – at the same spot as last time. Are we looking at Spinrite as a solution or is there a cheaper alternative? You’re ahead of me. SpinRite is where I’d turn to next. I’m re-thinking the CHKDSK command I used. CHKDSK D: /R If I put the parameters out of order, it probably didn’t execute the R switch. Hate to bother you one last time, but my fear in using Spinrite is that it may crash the drive. I recall using this product many years ago. All I can remember is that it worked that drive like crazy! If the drive is getting old, I don’t want to push it over the edge. This is my C drive – it has no data, just all my programs and the OS. Right now I’m attempting to defragment the drive in the hopes that the data will be moved from the problem sectors. I figured that was a softer answer. But if that fails, then I’ll probably have to invest in Spinrite and then hope and pray. Having a money-back guarantee won’t replace my C drive nor my programs. Since you tried to help me, I thought I’d share how I solved the problem with you. My option was to purchase Spinrite and fix the unreadable portions of the C drive. However it seems as if this drive may be failing and Spinrite puts a lot of pressure on the drives it tests (I remember using it once before), so I thought that it might kill the drive if the drive was beginning to fail and then I’d be up s**t’s creek without a paddle. So I thought of a softer option – defragmenting. When I did that the only section it couldn’t read was one containing my anti-virus files. That told me that the affected data wasn’t vital. I tried to clone after that, but no go. Then it occurred to me…at the 3% mark where it sticks, it asks Retry, Ignore, or Ignore All. The Retry and All options paralyze the system. But when I hit Ignore, it continues to the next problematic sector. So why not ignore every one? So I hit the “I” key about a million times and went to dinner. When I came back the drive had cloned! I’m running the cloned drive as I type this. Now I’m going to buy a drive exactly like the cloned one and use that as my new clone. Sounds like you might need a new drive. Please could you tell me why do i still have some of the browsing history on hard disk even though i deleted my google chrome browsing history? There is one site that always appears on my hard disk even if i don’t have it in browsing history?